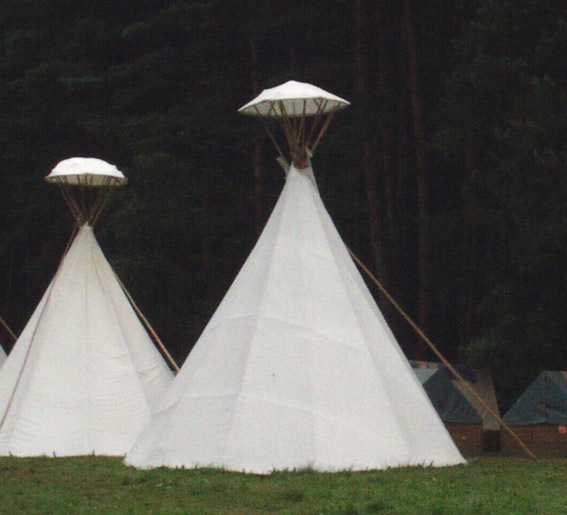 history, construction, our products - teepee from CONDOR. Visit our teepee photo gallery! 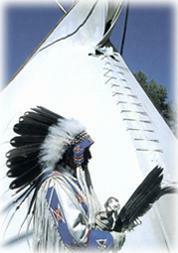 Let's start with a few words on the history of tipi. These inhabitable tents of conical shape were used by many natural folks - from the North of Scandinavia (the Laplanders), through the northern areas of contemporary Russia (the Nyenyens, the Chukchs and many others) to the North of America and Greenland (the Inuits). This basic construction had spread accross the prairies of Northern America where it naturalized and was brought to perfection. 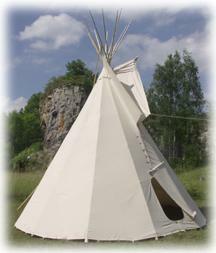 This also is where current Czech name for the tent - "týpí" (English "tipi", "tepee" or "teepee") - comes from. Originally smaller hide tents (up to 4 metres high), made by hunters and cultivators, started to grow bigger as horses - that were able to carry heavier loads - started to be employed. Lost horses of Spanish conquerors, who had invaded Mexico, naturalized soon and multiplied in the prairies - and the Indians made the best of this "white man's gift". Tents grew gradually up to 7 metres of height and their construction became really elaborate. The weight of the tent and its poles was no more limited by physical strength of humans and the Indians turned into hunters migrating over huge areas of land. 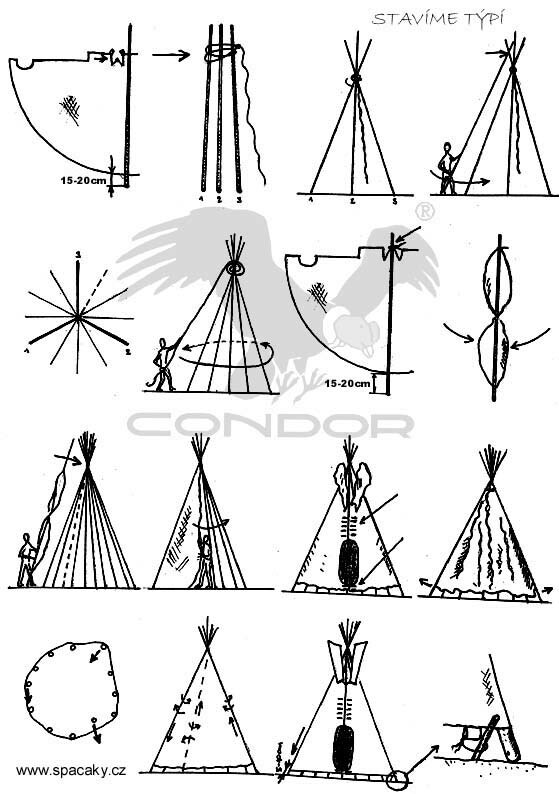 Details of the tipi construction and shapes of the tents differed in various areas, but the structure and the elementary construction itself were the same - from the North of Mexico to the South of Canada. In the half of the 19th century the hide was replaced by canvas - introduction of canvas was a historical milestone in tipi development. (Number of bisons decreased while the numbers of white tradesmen offering canvas started to grow.) 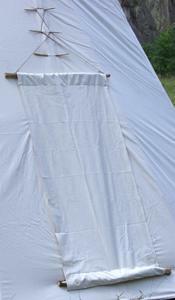 Tent made of canvas was much lighter but its production was more demanding. The biggest "assembly" tents had up to 8 metres and their size was not limited by weight anymore but by the length of poles. After the Indians were concentrated in reservations, the tipi lost its original importance as a mobile dwelling /habitation, home/ - today, it merely is a folkloric phenomenon. Tipi cover is basically a half-circle shape. It is scrolled into a cone, backed from inside by the pole construction. The cover has a hanger, smoke flaps, holes for the lacing pins and a door hole on and in it. 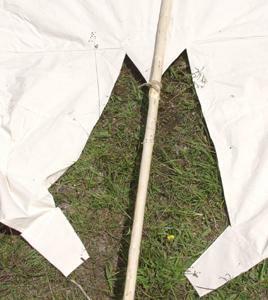 Most tipi covers have two wedges in their upper parts to better embrace the bundle of poles (the wedges make it easier to stretch the cover and there is much lower risk of the canvas ripping). 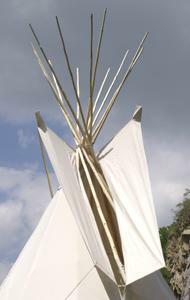 In the Czech Republic, there are two types of tipi construction competing - "Dakota" and "Seton". The shape called "Dakota" is derived from R. Laubin's description of tipis - it roughly corresponds with the tent shapes of the Dakota tribes. Centre of the drawn circle lies off the middle of the cover, approximately on the level of the peaks of the smoke flaps. 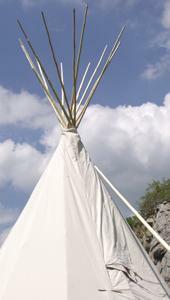 The tipi, when erected, looks a bit like "sitting on its bottom". The "Seton" type is taken from a description made by a famous collector of Indian traditions, trapper and writer, E. T. Seton. In this case, the centre of the drawn circle lies just in the middle of the cover, at the hanger, which means the tipi is centrally symmetrical. 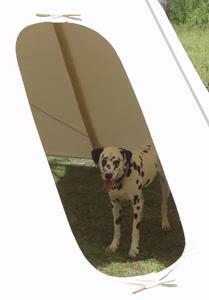 Radius of the circle roughly matches diameter of the tent, so it's often reffered to as the "size" of a tipi. These differences in shape are of almost no practical significance. Slight shape differences could have been found even within one tribe and were caused e.g. by the actual size of the bison hides used to make the cover, or by the actual level of laziness of each Indian's wives who might have refused to laboriously extend the hides at the outer edges of the tent. 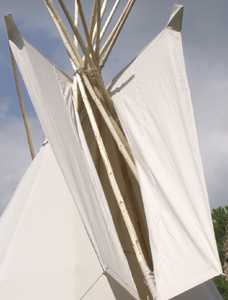 Under our conditions, it is probably more practical to use the "Seton" type tipi - it is easier to erect (as it has a symmetrical skeleton) and its inner space is by about 30 cm bigger when compared to a Dakota tent of the same radius. All what has been just said explains that slight differences in shapes and sizes, detectable in tents made by different tipi producers, are normal and do not indicate that one tipi is more and the other less "genuine". What can - and should be - compared is the quality of make: e.g. 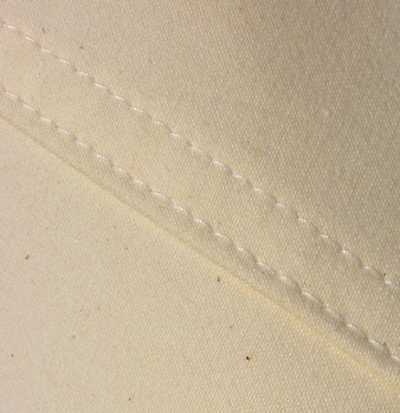 the way the lower edging is made and underlaid, quality and seaming of the holes for the lacing pins, location and spacing (up to 25 cm) of these holes, reinforcing of the hanger and of the cornets at the end of the smoke flaps, insertion of a wedge to the upper part of the flaps, and the way all the seams are done and neatened. Poles should be long, thin, light, solid, smooth and - of course - natural. In our woods, spruce is the most suitable tree. In an emergency, also pine (heavier, more fragile and crooked) or some deciduous trees can be used. In a dense new forest the trees grow fast and high in their hunt for more light. The tiniest of them are going to be snipped anyway - and these are just ideal for constructing the tipi skeleton. The forester will definitely tell us where to find such trees and will charge for them - in most cases - just as for mere fuel wood. The poles should be about 1 meter longer than the radius of the tipi, minimum diameter (thickness) of the poles in their uppermost part is cca 2 cm. Thin poles are the best - diameter in the lowermost part of the poles should be about 10 cm. 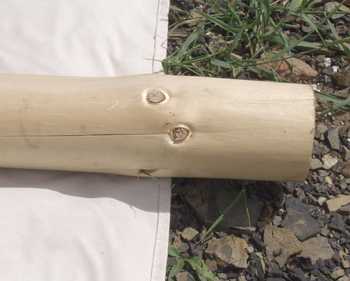 The poles are to be peeled of bark, with branch knots smoothed out. 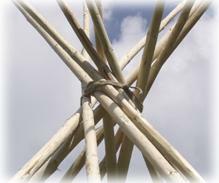 We need cca 11-20 poles, depending on the size of tipi and number of suitable spruces available. 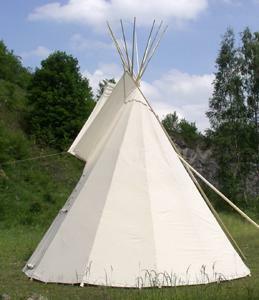 We can make following approximate recommendation: 11 poles for tipis up to 5 metres; at least 11, better 14 poles for a 6 m tipi; and 3 more poles for tipis the size of which exceeds 6 metres. To make transportation easier, we can use poles consisting of several parts. Stakes (pegs) are made of wood - they're about 20-40 cm long and cca 2-4 cm thick. Lacing pins are made of wooden rods; the pins are about 20 cm long and up to 1 cm thick. It's preferable to peel and smoothen the pins and taper them at one end (cca 5 mm in diameter). We should find a flat, dry and sunny place for erecting our tipi. Then we have to choose the direction the doorway is going to face. The Indians, driven by religious reasons, used to orientate their tents to the East or Southeast. Thanks to this orientation, with prevailing western winds, tipis were exhausting smoke efficiently. We mostly have northwestern winds (or northeastern winds from time to time) in the Czech Republic, so the doorway should ideally face the South or Southeast. At first, we have to unfold and spread the cover (beside the place where it is eventually going to stand) and place the three strongest (thickest) poles onto it. The lower ends of the poles should exceed the edge of the cover by about 10 cm. We mark the point where the poles touch the hanger and lash them together - thoroughly but losely - with a clothes-line or a strong hempen string. One end of the string - as long as one of the poles - is left untied. 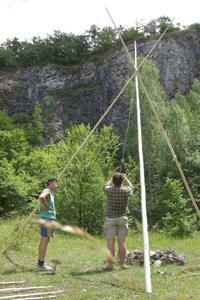 The poles are then raised and the legs of the tripod extended. One pole is placed against the doorway, the other two on the sides. The remaining poles are then gradually, in due order, laid upon this base - forming a regular spindle in the area where they lean against one another. On the rear side of the construction, one pole is to be skipped (left out) - the cover is later lashed to this last pole and placed in position. At the intersection, the poles are wrapped round several times by the loose end of the string - the end is then tied to one of the poles. The lower ends of the poles should be closer together at this stage. Now, we lash the cover's hanger to the last ("lifting") pole. We roll the cover closer to the pole, raise it - after the pole is in position, we draw the cover around the construction ("frame") and pin it together between the door poles with the lacing pins. Pinning is to begin from the top. We then shove the poles out until the cover is taut. It is quite likely that the edge of the cover doesn't have equal distance from the ground at all the poles (ideal distance is about 5-10 cm from the ground; close contact with the ground means the canvas is exposed to too much moisture and can be damaged). The distance, however, can be adjusted quite easily. The lifting pole and the poles of the tripod just have to be slightly em bedded to the ground (or, conversely, propped up, if necessary). The other poles are then easy to shift and adjust (just wag them if they resist being moved). 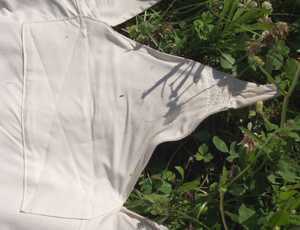 The bottom of the cover is then fastened to the ground by the wooden stakes (pegs). 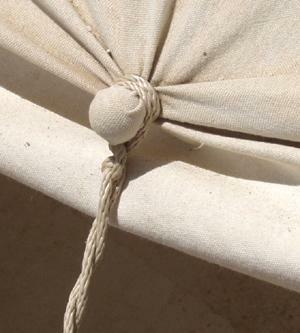 Round stones or marbles, tied to the lower edge, are often recommended as "stylish" - they, however, decrease the durability ("life") of the canvas cover. It is much better to use short and strong grommets for ropes - it is the rope that is fastened to the stake (peg) and its advantage is it's easily replacable. The marbles or grommets should be about 70 cm apart. Now we have to stretch the smoke flaps using the cords ("control ropes") and the last two poles (long poles on either side of the outside of the tipi). The final step is to hang the door flap over the doorway. 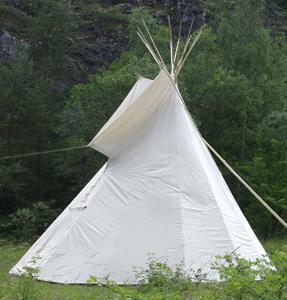 Even a "bare" tipi can easily be used, but if you want to dwell in it comfortably and for a longer period of time, you should have two essential accessories: the liner ("double wall", "inner wall", sometimes also called the "dew cover") and a "hat" ("cap" - a conic cover protecting the upper ends of poles from rain). The liner is the inner wall tied inside the poles cca 1,5-2 metres above the ground. The space between the cover and the liner ducts fresh air in and exhausts smoke up. 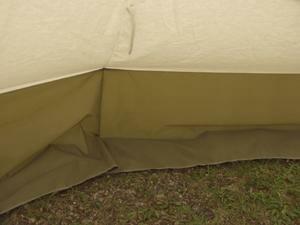 It also keeps bedding dry in a storm (water is not dripping from the poles - just off centre, of course) and helps to maintain acceptable temperature inside the tent when the weather is cold. The bottom part of the liner touches the ground or even lies on the ground (it is thus practical to make the lower part of the liner from a heavy-duty moisture-resistant material - this will greatly extend its life). The hat is a round bulging cover, having about 1,5 m in diameter, which covers the top of the construction (pole framework) and prevents water from running down the poles to the inside of the tent during heavy rains. 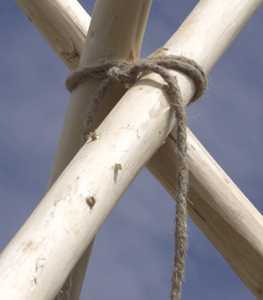 The hat is braced with hazel tree rods and placed onto the tops of the poles; three ropes, fastened to the bottom parts of poles, secure the hat in position. Some books denounce the hats as "not used much by the Indians" and "unsightly". Nevertheless, the hats proved to be utmost practical, especially when used on summer camps for children. 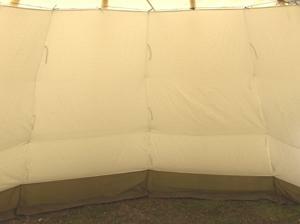 The fireplace is placed almost in the center of the tent (just under the opening between the smoke flaps). It usually is about 15 cm deep and is flanked by stones. Dry hardwood is the best wood to be burned (it does neither smoke, nor crackle too much and is calorific). Pine wood is also suitable, spruce wood less so. Lops can be burned with utmost circumspection only - just a handful to ignite the fire or to light up the tent shortly. It is surprising how even a small fire can heat up the tent. After some hours of heating, the glowing ashes can be piled up in the centre of the fireplace - this maintains moderate heating through the whole night. The fireplace can be also used for cooking. 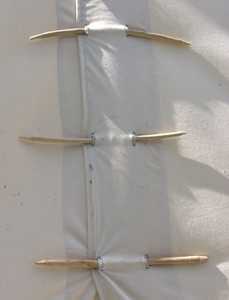 Traditional shanks and tripods can be replaced by a cord, hanging from the top of the tent to above the centre of the fireplace. 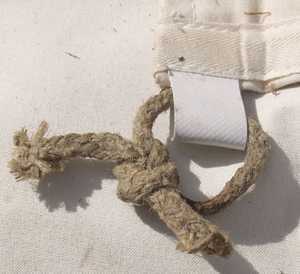 The cord has a firm loop knot ("hangman's knot") at its end, with a hook for the pot (thanks to the knot you can adjust the position of the pot). We can cook using the flames directly, or "savingly" i.e. just by slowly circling the pot round the fire. Handling the pot is really easy. And after you finish your cooking, you just fasten the rope to one of the poles. Combining the above mentioned rules, we can usually achieve satisfactory results. 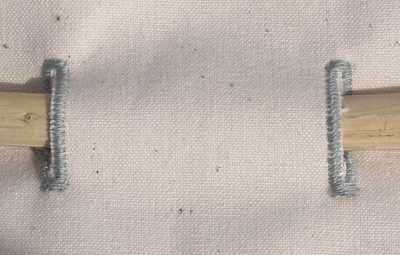 Closely woven waterproofed canvas and its relatively steep decline (cca 60 degrees) makes the cover impervious to rain. The smoke flaps can be overlapped. What is a problem, that's water running down the poles. Water drips from uneven and rough spots on the poles (branch knots, bark, joints - in poles consisting of several parts, etc.). It is therefore essential to peel, clean and smoothen the poles as well as possible (or to "bridge" possible joints by rods or strings that would lead water over them). The hat, however, seems to be the most reliable solution. 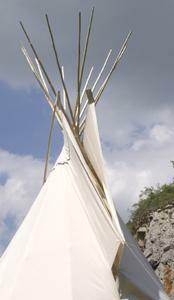 If you are interested in our teepee, please contact us for further information.